A world-class information sharing tool that connects grain growers and agronomy experts has been launched to help address every day and emerging on-farm challenges through collaboration between farmers and technical specialists. The new eXtensionAUS web platform is now live and offers ready access to resources and expert knowledge that can help growers address on-farm issues and adopt practice change. IPNI Australia and New Zealand is involved in providing its own technical content from its resources, serving on the panel of experts to review the information of others and to answer on-line questions, and Dr Norton (Regional Director) is chair of the nutrition community of practice. Growers can use the service to request solutions to specific agronomic issues from leading researchers and agronomy experts right across Australia. More than 100 specialists have so far registered their interest in eXtensionAUS with a growing number actively engaging with industry, sharing knowledge and working together in new ways. The platform is based on a system successfully implemented in the United States over the last decade, where technical experts can identify issues as they emerge in real-time and provide tailored advice to individual growers. After securing agreement to a transfer of the technology to Australia, the Grains Research and Development Corporation (GRDC) in partnership with the New South Wales Department of Primary Industries (DPI) and the Victorian Department of Environment and Primary Industries (DEPI) has now commenced a nine month trial of the system. 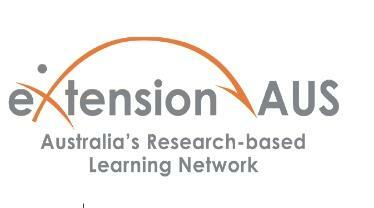 The test-phase of eXtensionAUS has established expert resources for crop nutrition administered by DPI and crop diseases by DEPI, with GRDC’s funding supporting the leadership teams in each pilot whose role it is to coordinate eXtensionAUS experts and generate practical information and content for the platform. The eXtensionAUS project provides that first step to getting a handle on an agronomic issue or what new practices could deliver benefits on-farm. The project is a great example of how innovative technology and initiatives from global grain-producers like the US can adpated to local issues, to help support interaction with Australian grain growers.